BANGKOK (Reuters) - Thailand's King Maha Vajiralongkorn is now the largest shareholder in the country's biggest industrial conglomerate, Siam Cement Group Pcl, data from the Stock Exchange of Thailand (SET), published on its website on Saturday showed. It shows the king as having a 33.30 percent share, making him the biggest shareholder in the construction and industrial supplies firm. The monarch's holdings in the company have a value of nearly 180 billion baht ($5.43 billion). It follows an announcement in June from the Crown Property Bureau (CPB) which said assets previously registered to the bureau would now be held "in the name of His Majesty", the latest shake-up in royal affairs under the king who has ruled since 2016, following the death of his father, King Bhumibol Adulyadej. 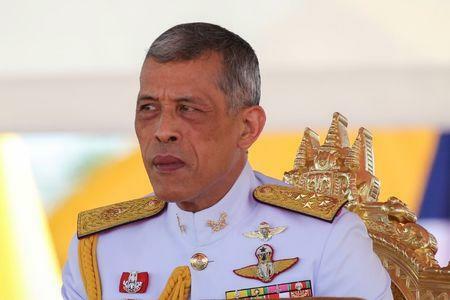 The June announcement saw King Vajiralongkorn, 66, take full, personal ownership of the bureau's assets. The exact size of the bureau is not made public, but Forbes magazine valued its holdings in real estate and other investments at more than $30 billion in 2012, making the king the richest monarch in the world. The king has overseen a major shake-up of royal affairs since taking the throne. Last year, a royal property law was amended to formally give him full control of the CPB, which manages the multi-billion dollar holdings of the monarchy and controls huge swathes of land in Bangkok, and in March he appointed Air Chief Marshal Satitpong Sukvimol as its director-general, replacing Chirayu Israngkun Na Ayuthaya, who had held the post since 1987. Reuters was unable to reach the palace for comment on Saturday. Last October, shares worth over $500 million in Siam Commercial Bank were transferred to the king. Currently, the king is listed as SCB's seventh-largest shareholder. The CPB is still listed as the bank's largest shareholder.